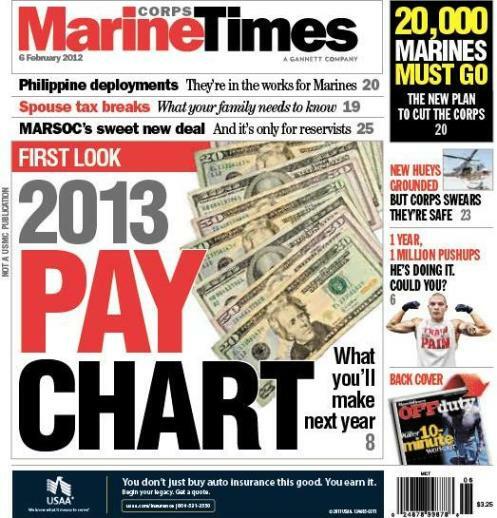 This week’s Marine Corps Times cover story hits Marines right where it counts: the wallet. The piece, written by Pentagon correspondent Andrew Tilghman, highlights the ups and downs for U.S. service members across all branches of service. Pay will continue to increase in 2013, and Marine Corps Times breaks down the boost by rank for officers and enlisted personnel. This week’s newspaper also offers a variety of analytical piece following last week’s big budget announcements at the Pentagon. We outline how the Corps shrinking to 182,100 Marines may occur and how the service may end up deploying to new locations in the Pacific on a rotational basis, including the Philippines. The issue is out on newsstands this week. Or, you can subscribe here online and read it now.